Welcome to 228 West Street, Berlin! 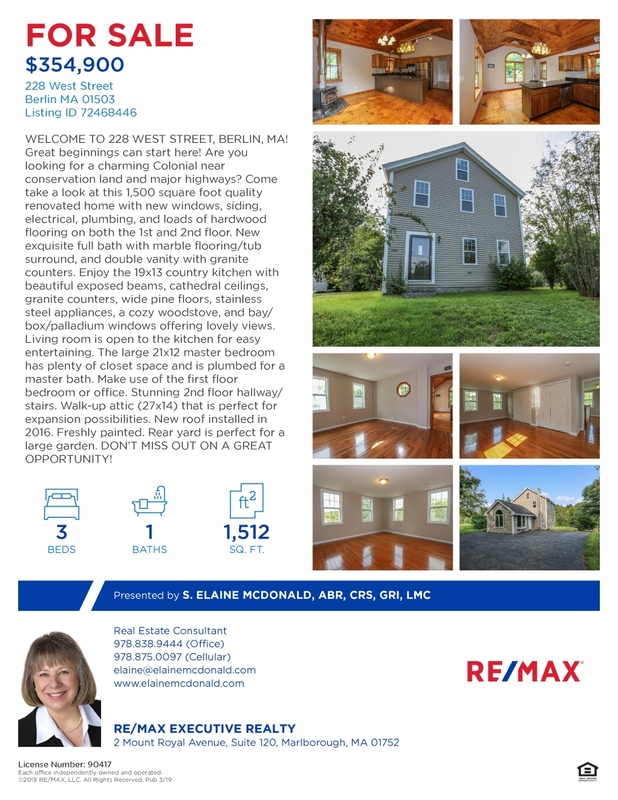 WELCOME TO 228 WEST STREET, BERLIN, MA! Great beginnings can start here! Are you looking for a charming Colonial near conservation land and major highways? Come take a look at this 1,500 square foot quality renovated home with new windows, siding, electrical, plumbing, and loads of hardwood flooring on both the 1st and 2nd floor. New exquisite full bath with marble flooring/tub surround, and double vanity with granite counters. Enjoy the 19x13 country kitchen with beautiful exposed beams, cathedral ceilings, granite counters, wide pine floors, stainless steel appliances, a cozy woodstove, and bay/box/palladium windows offering lovely views. Living room is open to the kitchen for easy entertaining. The large 21x12 master bedroom has plenty of closet space and is plumbed for a master bath. Make use of the first floor bedroom or office. Stunning 2nd floor hallway/stairs. Walk-up attic (27x14) that is perfect for expansion possibilities. New roof installed in 2016. Freshly painted. Rear yard is perfect for a large garden. DON’T MISS OUT ON A GREAT OPPORTUNITY! Click HERE to view the feature sheet larger or download and print.